As a participating golf school student, add on a round of golf at The Ritz-Carlton Golf Club, April 1st, 2019 through May 29th, 2019 is $75; May 30th, 2019 through September 19th, 2019 is $35, September 20th, 2019 through December 31st, 2019 is $65. 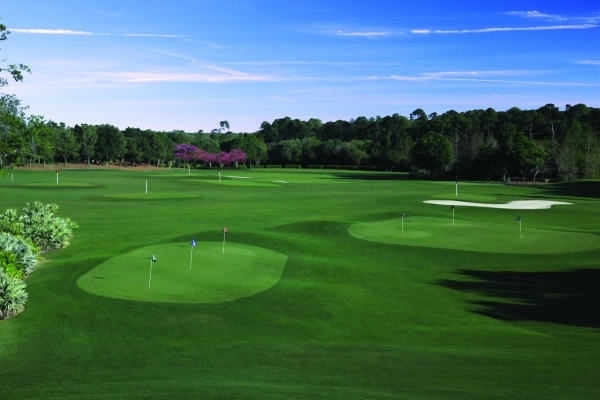 Add on a round of golf at Hawk's Landing Golf Club, April 1st, 2019 through May 31st, 2019 for $53 + tax; June 1st, 2019 through September 30th for $40 + tax. As a participating golf school student, add-on any spa treatment at The Spa at Grande Vista for 15% off retail value. The standard 3 day golf school lodging package includes 3 consecutive nights lodging during the golf school program at either Marriott's Grande Vista or Marriott's Shadow Ridge. Additional room nights can be purchased at a special rate, if available. Lodging packages are subject to villa availability.